At the AGM in October there was significant support for club night to be brought back in some shape or form. It had come to an end after a few trial formats didn't seem to hit the mark. Our aim is for club night to provide a great way for members to meet other members and play against people they haven't played before. It is also especially useful for new members (like those who joined the club at our successful Open Day on Saturday). We can't promise you a glassback in front of the Pyramids, but having listened to members' views, club night will now be FREE! 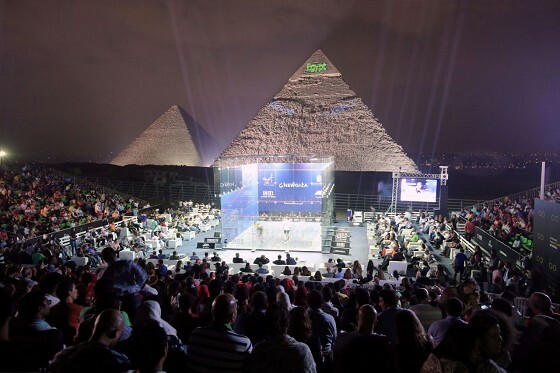 The format will be focused on just playing squash so there won't be any coaching as there was before. We want to get the balance right between people getting a decent game and not having to stand around waiting too long. So we will try two or three player single games of American scoring to 21 and then rotate new players on to the courts. At least one committee member will be on hand to help manage proceedings and the bar will be open until 9pm. This Sunday committee members Jezz Speechley and Adam Barnes will be there. The committee decided on Sunday evenings as this is a time when courts are available and we hope that it will suit a good number of members. It would be very helpful for Jezz and Adam to know how many members are likely to come this Sunday. So if you plan to come this Sunday or you think you will do in future, please can you send an email to Jezz at speechley@hotmail.com. The committee is also interested in knowing what you think about club night taking place on a Sunday and the start and finish times, so please do email Jezz if you have any views on this also. The TWSRC Summer Party 2019 on Sunday 21st July. Book early to save £10! Your new Club Night - An update and request for feedback! Monday social squash sessions - a reminder! Support your club and buy your tickets for the Colin Payne Kent Open! Harvey's at Home for Christmas? World's longest hunger strike over - TWSRC a win a week over too! Club Open Day - date change! Junior Coaching Returns THIS SUNDAY! World of Squash golf Day. Winner-takes-all high stakes racquetball challenge match! Watch England v Wales in the Six Nations + Curry & Cobra only £8! Tonight's Big Bash starts at 7pm! New Year Celebration at The Spa Hotel - update! New Look Club Night plus Happy Hour! Club Annual General Meeting today at 8 p.m.
Lost set of keys- Sunday night. Quiz and Hawaiian theme night Friday 11th August. Bank Hoilday Monday: Bar closed. Friday circuits - who's coming? More great news - refurbishment of Ladies changing room. Court A available to book tonight. Looking to join a quiet gym/sauna/ swimming pool. Quiz Night Tonight....remember your Christmas Jumpers!! Friday 2nd December - Christmas Quiz Night. Free Squash at Club Night tonight!! Important Finals Night and Accumulator News!! !